Moonbeats Asia have announced a celebratory party this Labour Day, aptly named All Play No Work. The lineup consists of French multi-instrumentalist FKJ, British electronic duo Bondax and Singapore's very own KiDG from Eatmepoptart. FKJ will be returning for his third time this May after a strong showing in September last year. His debut album French Kiwi Juice, which was released in March 2017, was met with positive critical reception. Bondax will also be returning to Singapore after last performing here last April. Known for their unique take on future garage and electronic music, Bondax have performed at renowned festivals such as Creamfields, Bestival and more. Eatmepoptart has been a staple in Singapore's club scene, known for their upbeat mix of buoyant indie rock anthems and 80s synth-pop favourites. Eatmepoptart will be kicking off the night, with FKJ performing after and Bondax closing out the night. 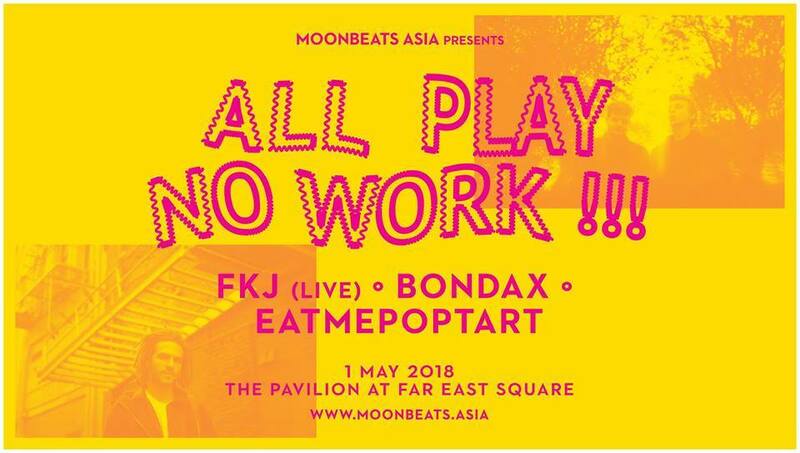 Moonbeats Asia presents All Play No Work will take place on Tuesday, 1 May at The Pavilion @ Far East Square from 7.30pm onwards. Standard tickets are available for S$85, and tickets at the door can be purchased for S$100. Get your tickets here.